I’ve been looking forward to trying this brew for a while, since I first read about fairly new Latin-American brewers 5 Rabbit Cerveceria in Chicago. Randy Mosher, the guy who formulates their recipes, is my all-time favorite beer author and a great guy to talk to if you ever get the chance, but I’m not sure if I’ve ever had much of a chance before this to actually drink his beers. Now I’m very glad to say that I have, thanks to the singles rack in a suburban Binny’s Beverage Depot. I must say after tasting it that this description is as accurate as I’ve read on a beer label in some time. That pretty much hits the nail on the head. Here is my full tasting note. APPEARANCE: Dark, ruby-red and somewhat hazy, with an inch of lasting foam that took quite a while to dispel. Very pretty. AROMA: Complex spiciness is the first thing that I get, and dried fruits, and molasses. There’s a lot going on here. It smells a little boozy, but that’s probably the fruitiness coming through. The only thing I don’t smell is hops. TASTE: Not too sweet but very complex, with malt flavors of raisins and prune. The chile is kept restrained but it definitely comes through with peppery and smoky flavors in the finish. MOUTHFEEL: Medium-full. Substantial but not the heaviest thing out there. DRINKABILITY: Spiced beers and chile beers in particular really aren’t typically my thing, but I think everything works very well in concert here. These are married, layered flavors that clearly took a deft touch to pull off just right. It elevates this to something that one could drink multiple beers of, which may be something I’ve never said about a beer with chiles before. OVERALL: A very solid 3 hops on its own. I have a feeling that this beer would be superb with certain foods, and could manage an even higher rating if it was somehow considered in that context. Regardless, I am impressed by the balance and restraint, and I look forward to trying more 5 Rabbit beers in the future. 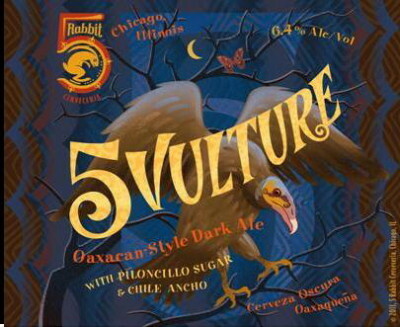 Posted in Tasting Notes.Tagged 5 Rabbit, 5 rabbit 5 vulture, 5 Rabbit Brewery, 5 Rabbit Cerveceria, 5 vulture, chicago beer, chicago breweries.